Have we broken Olympic records for the last time? With the 2012 London Games fast approaching, sports fans and pundits alike are wondering how many records athletes will break this year. And it's hard to blame them — after all, world records were broken in 33 separate events four years ago in Beijing. So why are the experts predicting far fewer records this time around? Some experts say there's a hard biological limit to just how fast a person can run. Or how high someone can jump. How soon will we reach the physical limits to our ability to break Olympic records? Writing in Significance Magazine, Gavin Thompson has noted that today's athletes would scarcely resemble those from a century ago. The winner of the men's 5,000m in Beijing ran at a pace that won the 1,500m in 1908, while the winner of the women's marathon would have won the men's race of 1908 by an entire half hour. There's no question that today's athletes are bigger, stronger, and faster than those of the past — and there's good reason for it. As Thompson notes, athletes have benefited from technological and medical advancements. Combine that with a significantly larger pool of world-class athletes, and you get a competitive class of competitors unlike anything seen before. Contributing to this mix are such things as first-class trainers and training facilities, the application of sports science, competition calendars, and standardized regulations. But there's also a mathematical logic to the setting of new standards. The early days of a sport tends to see records broken regularly and by significant margins, but as athletes get better and their techniques continually refined, records start to become few and far between. World records tend to follow a logical progression which sees them plateau after a certain period of time. And this is exactly where many athletes find themselves now — and much of it may have to do with the hitting of hard, biological limits. According to Thompson, a number of studies have suggested that the limits on human capacities peaked in track-and-field in 1988. The subsequent era seemed to confirm this, when it took eight athletes 16 years (1991 to 2007) to shave 0.16 seconds off the 100m dash record. But then a strange thing happened, and his name was Usain Bolt. The Jamaican sprinter managed to accomplish the exact same feat in just one year. In 2008, at the Beijing Olympic Games, Bolt ran the 100m in just 9.69 seconds, setting a new world record. 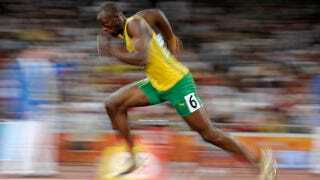 A year later, Bolt surpassed his own feat with an astonishing 9.58-second run at the 2009 Berlin World Championships. The accomplishment showed how difficult it is to predict limits on performances, and how athletes are continually able to take their sport to the next level. Bolt isn't the only example. As noted, 33 different sports had records broken in Beijing, which would seem to throw conventional thinking out the window. Specifically, there was one in women's team archery, four in weightlifting, five in athletics, two in track cycling, and the remainder in swimming. Bolt's records in particular forced the mathematician Reza Noubary to go back to the drawing board with his calculations; he had previously estimated that the best possible time for the 100m dash is 9.44 seconds — but now he's not so sure. Weyand divides each cycle of a runner's leg into what happens when their foot is in the air, and what happens when it's on the ground. The former is surprisingly irrelevant. Back in 2000, Weyand showed that, at top speed, every runner takes around a third of a second to pick their foot up and put it down again. "It's the same from Usain Bolt to Grandma," he says. "She can't run as fast as him but at her top speed, she's repositioning her foot at the same speed." What these sports scientists are finding is that, despite these remarkable performances, human limits have not been reached. It's possible, for example, that a future runner could strike the ground with more force and sustain that over a longer period of time. Alternately, Yong describes how Marcus Purdy from the University of Melbourne has used computer simulations to show that calf muscles, more than any other, determines the amount of force that runners apply. This could be an area that future runners could exploit. Now all this said, there are some other important factors to consider. Some sports analysts like Ollie Williams are suggesting that hard biological limits are indeed a consideration — and that recent changes to sports can account for records — or lack thereof. A good example is the ultra-hydrodynamic suit worn in swimming. Though popular in Beijing, they are now banned. And as Williams reveals, it's interesting to note that no female swimmer has broken a world record since that ban went into effect in 2009. Analysts predict that no records will be broken in the pools in London as a result. It's also thought that tougher clampdowns on doping will also yield fewer records, particularly on the track. Take Michael Johnson's 1999 record in the 400m dash. No one has been able to touch it, and it's thought that previous eras in which lax doping standards were not enforced are to blame. Regardless of these factors, it's safe to suggest that making predictions is next to impossible. Just when a record is declared unbeatable, someone comes around to threaten it — consequently pushing our sense of what humans are capable of to the next level. Top image via LosThatSports. Inset images via BittenBound, BodyComposition, Examiner.